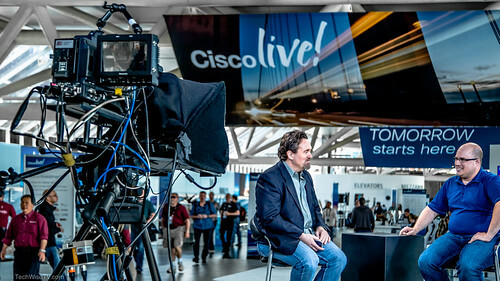 One of the best times I always have at Cisco Live involves getting to play ‘TV Anchor’ for the various live shows we stream. Well the Cisco TV team lets us use their equipment to do a live version of TechWiseTV each afternoon as well. Now honestly, I do plan these out…a little. But our day three show is generally a ‘hey…what do we WANT to do” kind of show. Planning for day 3 simply involved asking Jimmy Ray and Tina what they wanted. We had TWO wireless cameras this year to play with so it felt like we could do a little more. As for me (with input from the hillbilly of course), we wanted to take advantage of Wireless Stew’s presence and get him up to tell his story…so that is how we started. Stewart Gouman’s is a fantastic fan of the show, running his wireless consultancy and very informative blog from the Great White North. 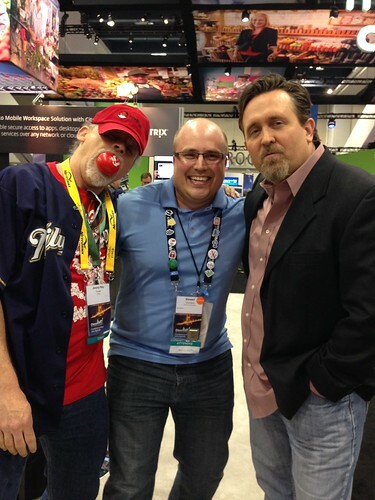 He has sought us out in just a few visits over the years stopping by the studio in San Jose or catching us while at Cisco Live when we all end up in the same place. Watch the show and get his career and community advice. Tina gave an ‘intoxicating’ review of her favorite IoT demo at the wine bar. Jimmy Ray ran back to one of his favorite netflow analyzer’s Plixer. Did you miss it while live? Catch it now…just as it happened.. Please is all ours Stew! Looking forward to doing more stuff with you in the future. Thanks Robb, Jimmy Ray, Tina, Frances, Steve and TWTV Team for making this a reality.